This is exactly what scientists Dr. David Baker and Dr. Joshua McClure from the U.S. Army Research Laboratory are doing to lighten the load and enhance the power of Soldier devices used on the battlefield. Their research, conducted in collaboration with Prof. Marina Leite and Dr. Chen Gong at the University of Maryland and Prof. Alexandre Rocha at the Universidade Estadual Paulista in Brazil, was recently featured on the cover of the Sept. 4 issue of Advanced Optical Materials. The research paper, "Band Structure Engineering by Alloying for Photonics," focuses on control of the optical and plasmonic properties of gold and silver alloys by changing alloy chemical composition. "We demonstrated and characterized gold/silver alloys with tuned optical properties, known as surface plasmon polaritons, which can be used in a wide array of photonic applications," Baker said. "The fundamental effort combined experiment and theory to explain the origin of the alloys' optical behavior. The work highlights that the electronic structure of the metallic surface may be engineered upon changing the alloy's chemical composition, paving the way for integration into many different applications where individual metals otherwise fail to have the right characteristics." The research focused on combining experimental and theoretical efforts to elucidate the alloyed material's electronic structure with direct implications for the optical behavior. According to the researchers, the insights gained enable one to tune the optical dispersion and light-harvesting capability of these materials, which can outperform systems made of individual elements like gold. "The insights of the paper are useful to Soldiers because they can be applied to a variety of applications including, but not limited to: photocatalytic reactions, sensing/detection and nanoscale laser applications," McClure said. "When tuned properly, the integrated alloyed materials can lead to reductions in the weight of energy harvesting devices, lower power requirements for electronics and even more powerful optical sensors." The researchers are currently looking at other metallic alloys and anticipate that their combined experimental and computational approach may be extended to other materials, including nonmetallic systems. "The field of plasmonics enables potentially paradigm shifting characteristics with applications to the warfighter; this includes everything from computation, to energy harvesting, to communication, and even directed energy," Baker said. "However, researchers in these fields are limited to a handful of elements on the periodic table; gold and silver are two of the most commonly studied. This lack of options limits the available properties for technology development. 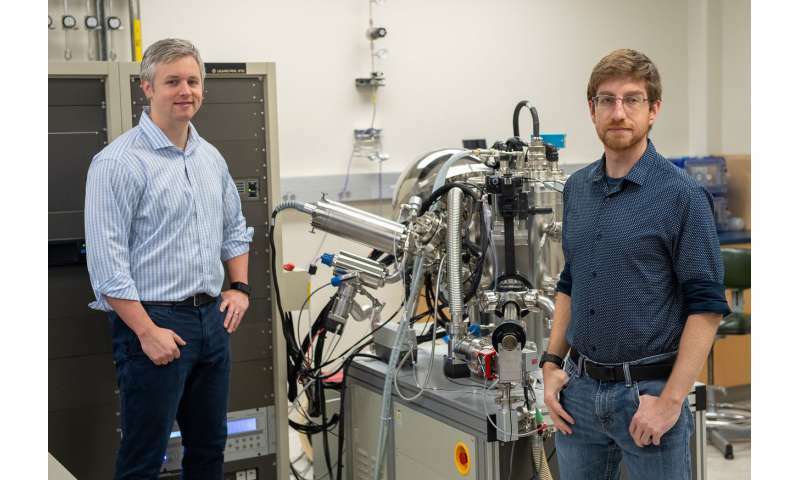 By knowing the fundamental optical and electronic properties of alloys, we can develop new designer materials with a broader range of capabilities." For the researchers, having their work selected to be on the cover of the journal is very exciting personally and professionally, and brings to light what they are developing for the success of the future Soldier. They noted that this acknowledgement highlights that the broader scientific community recognizes the value of their contributions and research direction, and it is clear that their methods and alloyed materials are becoming increasingly more important and relevant for a variety of photonic applications.